Despite being about 92% water, watermelons are packed full of helpful nutrients. These include calcium, iron, riboflavin, vitamin B6, folate, thiamin, magnesium and many more. Out of all fruits and vegetables, watermelons contain the most lycopene, an essential nutrient for humans. Lycopene can help prevent heart disease and various cancers. It is also used in the treatment of Human Papilloma Virus (HPV), asthma, and cataracts. Watermelons also act as a powerful antioxident due to their high concentration of vitamins A and C.
In addition to overall hydration, consuming watermelon has many health benefits for people due to their nutrient rich nature. 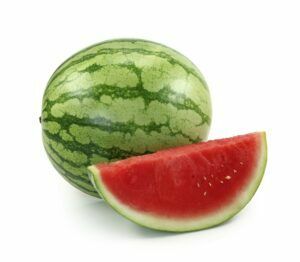 Watermelons aid in digestive health, muscle soreness and movement, inflammation, sleep regularity, and even cognitive functioning such as memory and learning due to their choline content, which maintains cell membrane structure where nerve impulses take place. The antioxident properties of watermelon helps fight free radicals that could lead to cancer. Also, studies have shown that lycopene prevents the spread of prostate cancer. Furthermore, vitamin C–best known for its contribution to immune health–aids in the production of collagen, which is necessary for healthy skin and hair. Vitamin A also has skin and hair benefits as it keeps both moisturized and maintains their growth. Consuming an abundance of watermelon produces no serious side effects. However, eating too much fruit in general may lead to a build up of potassium and lycopene in the body. People with hyperkalemia should be weary of consuming too much potassium as it could result in cardiovascular problems such as irregular heartbeat. These individuals should limit their watermelon intake to about 1 cup per day. Too much lycopene could result in bloating, nausea, diarrhea and indigestion.